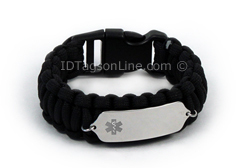 Black Paracord Medical ID Bracelet with Clear Medical Emblem. Black Paracord Medical ID Bracelet, IDPR23 (ID Tag size 1-5/8" x 7/8"), features .062" thick premium grade non allergenic surgical Stainless Steel Plaque. It is guaranteed to be rust free for life. The medical logo comes in Polished state. Bracelet locks by heavy duty side release polycarbonate buckle with dual 4-strand attachment. Black Paracord is 13.1 feet long and rated to maximum load of 350lb. High reflective quality of the mirror finish of the Id plate is combined with the deep engraving of the medical information. This creates exceptional contrast of letters and high durability of the product, which will provide a good protection for years to come. The bracelet tag is slightly curved for wrist wear. We can engrave 5 lines (14 Characters Max. in each line) of personal or medical information on the tag. If in the future your medical situation will change and you will need a new Medical Id Plate, we offer replacements at this page. Thanks for visiting idtagsonline.com store. How to choose the correct size of Paracord Bracelet. Enter your result below as is without adding anything. We will add 1/4" for comfort.